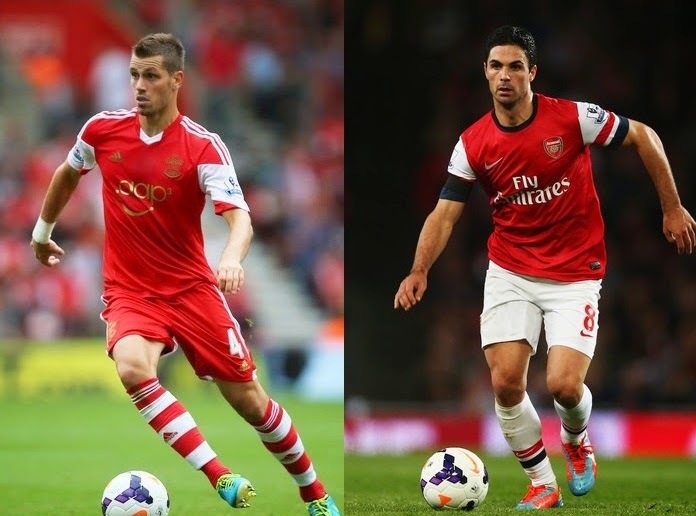 Arsenal Comparison: Schneiderlin vs Arteta: According to reports suggesting from various media outlets, Arsenal are in the race again for the Southampton midfielder Morgan Schneiderlin. According to reports suggesting from various media outlets, Arsenal are in the race again for the Southampton midfielder Morgan Schneiderlin. After pursuing the signature of German midfielder Sami Khedira for quite a long period of time, it seems Arsenal have accepted a defeat as the reports of Sami Khedira moving to Monaco are surfacing. Moreover, it was the wage demands more than anything else that kept the Gunners from signing the German National. At 24 years of age and with a French nationality to his name, Morgan seems good to fit the Arsenal model if not perfect. Having started 31 games for the Saints last season scoring 2 goals in the process which is not bad considering he is mainly a defensive midfielder for Southampton, the French national looks to choose between Tottenham and Arsenal as the new season approaches us. Having signed for Southampton in 2008 after seeing his side Strasbourg relegated from Ligue 1, the Frenchman made his debut on the English soil. However his 1st goal for the club came nearly after 2 years lamenting the fact that he is not a proven goal-scorer. In 205 appearances for Southampton, the Frenchman has managed just 10 goals to his name. If reports emerging out from goal.com are believed to be true, then Arsenal have doubled their efforts to confirm the signature of the French National. If Champions League and a lucrative salary package offered by Arsenal is a temptation, then playing under the former Boss Mauricio Pochettino at the White Hart Lane seems not a bad choice for the 24 year old. Following the departures of Luke Shaw, Rickie Lambert, Adam Lallana and an imminent departure of Dejan Lovren, the new Southampton boss is playing hardball over the deal which is more than understandable. After seeing the departure of 1st choice midfielder, left back and a striker, the Saints fans will be praying that this transfer should not materialize. "Everyone has ambitions, everyone has his own future in his hands, so we'll see. Every player wants to play on big occasions’’ Morgan. However in addition the desire shown above by him to play at a big occasion, he also shown his respect for the former boss. Therefore if both the comments are kept into consideration, then the midfielder is keeping both his options open.